I strongly believe that everyone must have at least one constructive hobby. A hobby that helps them express. A hobby that helps them release excess energy in creative ways. A hobby that keeps the mind busy, so that it doesn't get time to dwell on negativity. I am a person with a hyperactive mind. Therefore, I have been involved in a lot of different hobbies over the years. I love making new stuff, be it through art & craft, or needlework, or cooking (occasionally), or some designing on the computer. 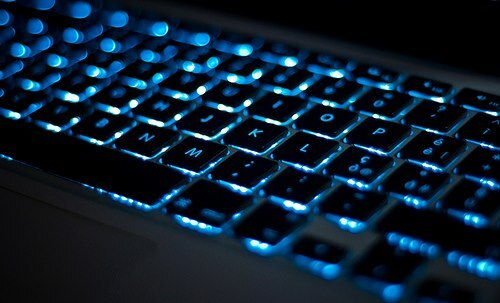 Blogging is one of my current favorite hobbies. Watching English movies is another. I also love listening to music. So what's my most favorite hobby? What's that one thing I like doing more than anything else? It took a while for me to figure this one out. Eventually it was Dad who helped me realize this. My most favorite hobby is reading. It is that one thing that I'm addicted to... the one thing that I simply can't control! If I start a book, it becomes impossible for me to put it down without completing it. I no longer remember to eat or drink or sleep or work. It's almost as if I don't even exist here anymore... as if I'm in some other world - the world of the book. My Dad now gets terrified the moment he sees another book in my hands! To be honest, even I am scared now of picking up another book to read! I have got so many awesome books sitting in my books almirah, waiting to be read. And then there are so many more on the kindle app on my phone! I probably have enough reading material for two years of continuous reading! I seriously need to work on my self control regarding books! Do you have any favorite hobbies? Do you have any such "addictions" that scare the hell out of you? This is my last post for KBL Jun 2015: My Favorites. Link to the previous post: My Favorite Extra-Curricular Activity In School. In my school, there were dozens of extra-curricular activities we could choose from and attend in our bi-weekly activity classes. There were different sports, including Boxing, Table Tennis, Gymnastics and Horse Riding. There were DIY classes like Needlework, Doll Making, Flower Decoration, Batik, Carpentry and even Home Science & Food Preservation. Then there were the Music and Dance classes too, as well as Debate and Elocution, and a lot of other things that I don't remember now. In my 12 years of school life, I have attended a lot of different activity classes and learnt a variety of stuff. My mom once went and told my class teacher to put me in Dance. Imagine a fat 10-year-old with two left feet, trying to do Kathak and Bharatnatyam! Catastrophe, right? Nevertheless, I got selected as one of the dancers for the Varsha Mangal Utsav that year! As one of the extra dancers, okay, but I did get selected! LOL! :D The Dance teachers at my school refused to take me in their activity after that one year! I once tried to enroll myself for the Gardening activity, but they refused to take me saying that there weren't any other females in that activity. That was a bummer. Oh and my teacher in class five automatically put me in Computer Science activity because of my marks in Mathematics. That was the year Computers were introduced in my school. That was actually one of the best things to happen to me in school. It turned out to be my favorite subject after all. It wasn't my favorite extra-curricular activity though. So what was my favorite extra-curricular activity in school? I was first put into this activity in class two, I think. Back then, we used to have these classes in the senior building, in a huge hall that later became our Bio Lab. I remember the big piano in the corner. All of us would gather around it and sing in chorus. I chose this activity several times after that. Our Western Music teacher changed. The classroom also changed several times. The piano stayed though. I really enjoyed singing all those English songs, including the Christmas Carols. I remember there was a crazy song that went "Did Charlie make a monkey out of you? Do you think you should be living in the zoo?" It was absolutely crazy! Was on human evolution, I think. Then there was another one - "All I want for Christmas is my two front teeth!" We used to note these songs down in a diary in beautiful colored pens. And then we would decorate that diary with stickers and crystals and sequins and whatever else we could lay our hands on. I still have mine somewhere in one of my cupboards at home. One of these days, I will dig it out and see if I can remember the tunes of all the songs in it. 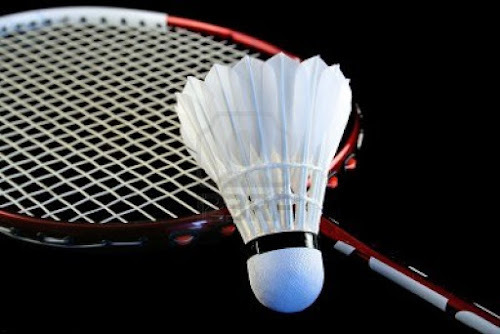 Did you have extra-curricular activities in your school? If yes, then what were your favorite? This is my 29th post for KBL Jun 2015: My Favorites. Link to the previous post: My Favorite TV Show. And it's back! My favorite TV show is back! Dance India Dance, with its brand new Season 5! 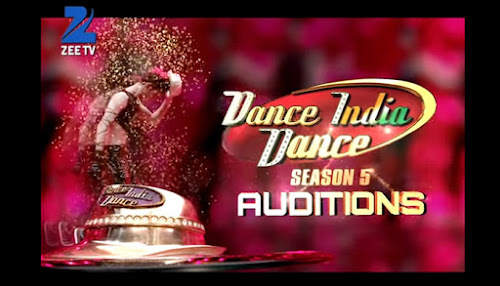 The telecast of the auditions started this weekend. Last year, I couldn't watch this show because we were keeping the store open till 9:30 at night. This year, I decided to cut myself some slack. We now try to pack-up for the day at 8:30 pm, so that even if there is a last-minute customer, we still reach home before 9 pm. It's a good thing I made this change in time for D-I-D Season 5. Looks like there are going to be some really awesome dancers in the show this time. And the judges seem hell bent on having super fun on the set. I thoroughly enjoyed Master Puneet's ragging on the show yesterday. As a matter of fact, I was quite surprised to find out that he's going to be one of the judges this time. He was a contestant in Season 2! He's come a long way, hasn't he? Anyway, I haven't yet decided whose team I'll be supporting this time. Are you guys planning to follow this show? Do you have any favorite TV shows? Which ones? This is my 28th post for KBL Jun 2015: My Favorites. Link to the previous post: My Favorite Animal. 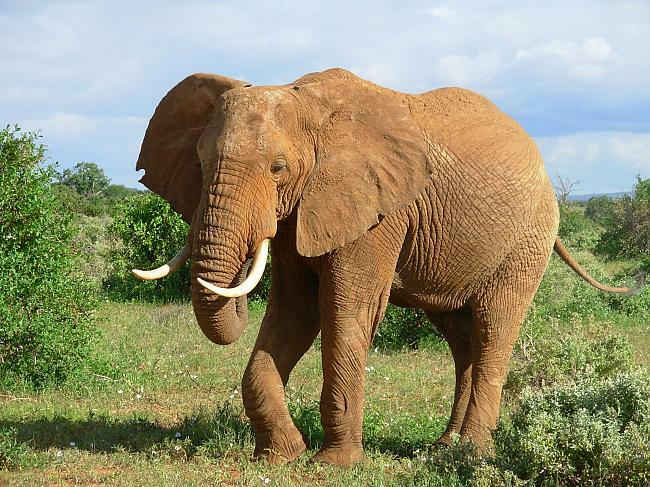 Well, I like the big cats too, but I have always been in special awe of this great creature - the elephant. It is huge, yet gentle. It is intelligent, and it seems solid like a rock all the way through. Plus, it has such a cute smile. 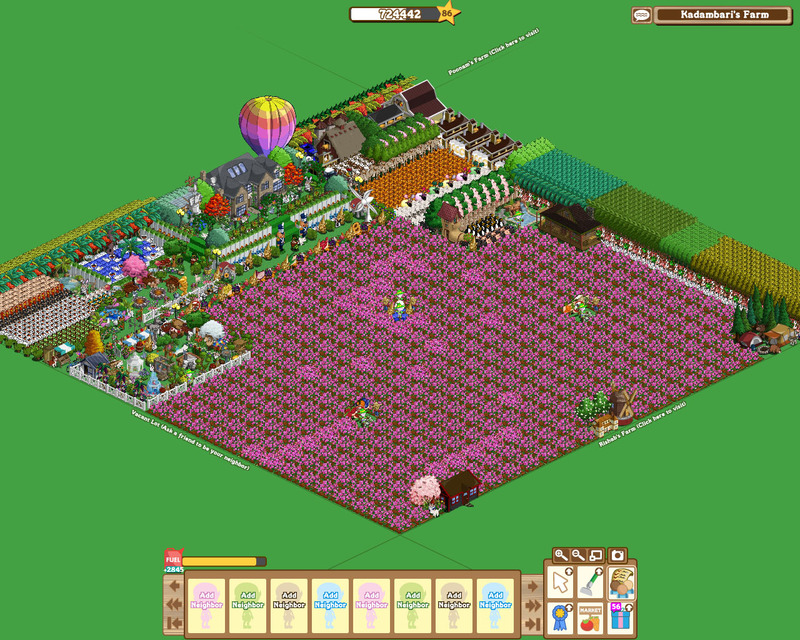 Oh and don't forget to read about my baby elephants in Farmville! Actually, while you're at it, you might also like to check out pictures of this mommy-and-baby-elephant pair I have in wood. This is my 27th post for KBL Jun 2015: My Favorites. Link to the previous post: My Favorite Bird. 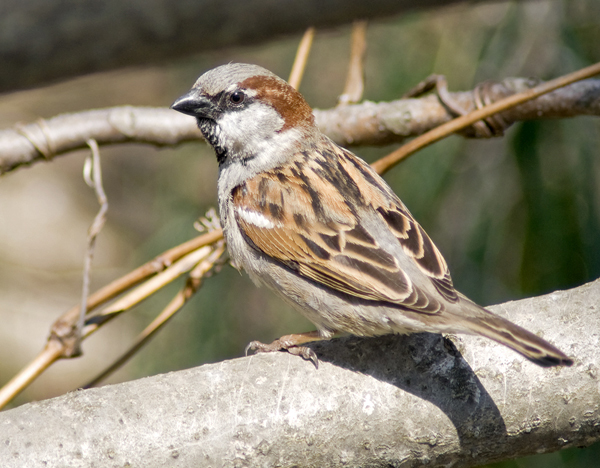 My favorite bird has always been the house sparrow. It is tiny and chubby, and it keeps on an incessant "choon-choon"! This was the most common bird in our house when we lived in Kanpur. We had an equal number of crows there too, but they are not my favorite. Their "caw-caw" sounds too shrill and aggressive. 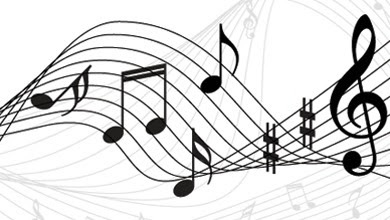 This little bird's "choon-choon", on the other hand, sounds more like music. I didn't see this bird in Patna for many years, but they are abundant here in Jaipur. In fact, I'm sure there are at least three nests of these birds on top of my shop-shutter. So yeah, I get to hear that "music" all day long now! Sometimes, it turns into noise too though. I find it quite surprising that such tiny little things can make so much noise, but they usually turn it down if I go out and tell them to shut up. Oh yes... communication is the key, after all. LOL! Do you have favorite birds? Which ones? This is my 26th post for KBL Jun 2015: My Favorites. Link to the previous post: My Favorite God. I am not a religious person at all. I don't do the daily puja and stuff. I used to till a few years ago, but then I realized suddenly that all this ritual worship is just not my thing. That doesn't mean I don't believe in God though. On the contrary, I'm a very firm believer in the existence of God. The way I look at it, all our Indian Gods simply represent different energies of the Universe. They are like symbols, that connect us with their respective energies. For example, Lord Hanuman is the symbol for protective energy and courage. Goddess Saraswati is the symbol for wisdom, knowledge and creativity. Lord Ganesha is for removing obstacles. Whichever energy we lack at any point of time, we can think about that particular God and invite that energy into our life. So who is my favorite God then? 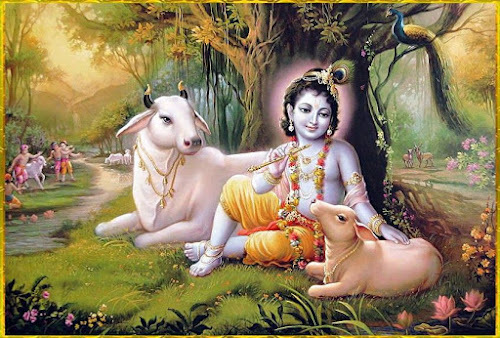 With no disrespect for the other Gods (and I'm sure they won't take any), my favorite God is Lord Krishna. To me, Lord Krishna represents the beauty and depth in all the different relationships possible. As a son, as a friend, as a lover, as a healer, as a guru, even as a foe. And it's not just his relationships with humans, but also with plants and animals. He was naughty, but he wasn't cruel. He was kind and helpful, and he kept his promises. He was a never-ending source of wisdom. A patient teacher and a considerate lover. He was a complete "all-in-one". I bet Raymond's "complete man" tagline was inspired by him! Anyway, do you have any favorite God? If yes, then who? And why? This is my 25th post for KBL Jun 2015: My Favorites. 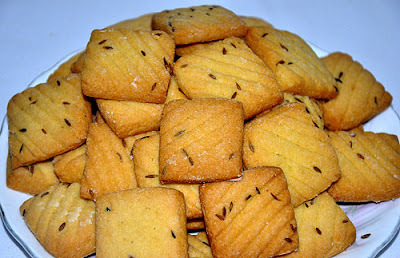 Link to the previous post: My Favorite Cookies. I like cookies a lot. As in a LOT lot. I could gorge on them all day if a genie would grant me the wish of being able to eat whatever I wanted to without gaining a single extra pound in body weight! Alas, I haven't found such a genie yet! So I'm forced to stick within moderate limits. 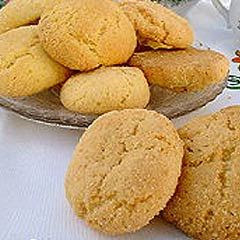 It is one of my wild dreams that someday I would make cookies at home. And bread too. I say wild though, because with my store, I'm most certainly not going to get any time for baking! Anyway, do you like cookies? If yes, then which ones are your favorite? Do you bake cookies at home? Do you wish you could? This is my 24th post for KBL Jun 2015: My Favorites. Link to the previous post: My Favorite Flowers. Some people like roses, some like tulips, my mom used to love rajnigandha flowers. I don't have any such favorites. I just like yellow flowers. They can be sunflowers or roses or tulips or dandelions or a field of mustard flowers, or any of those thousands of different varieties whose names I don't know. As long as they are yellow, they are my favorite. Now, I've become older, more practical, and too much of a cynic perhaps. Yellow flowers don't fill my heart with overflowing happiness anymore. They just remind me of the person who once was. I don't rush to hug them anymore. Instead, I just make a silent wish that the world doesn't steal their sunshine from them. 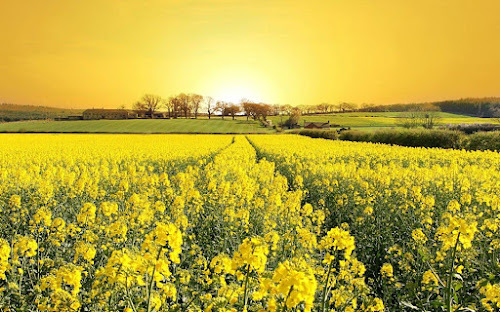 I don't know if I'll ever be like yellow flowers again, but they are still my favorite flowers. Do you have any favorite flowers? Which ones? This is my 23rd post for KBL Jun 2015: My Favorites. Link to the previous post: My Favorite Outdoor Game. In senior school, we were allowed to bring our own badminton rackets when we had games periods. That's when I finally stopped bunking those classes! Actually, this is one outdoor game Dad used to play with us (my sister and I) when we were kids. Maybe that's why I developed a liking for it. He taught us how to play this game at an early age. What about you? Did you enjoy outdoor sports more than I did? Which one was/is your favorite? This is my 22nd post for KBL Jun 2015: My Favorites. Link to the previous post: My Favorite Cartoon Show. I've seen so many different cartoon shows as I grew up. Yet, my all-time favorite still remains Tom & Jerry. 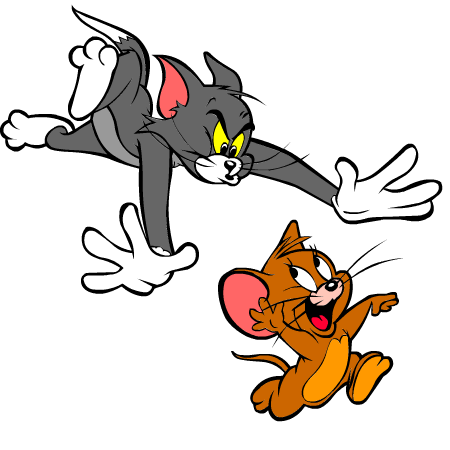 Even today, after all these years, I can get stuck on a channel if it's showing an episode of Tom & Jerry, especially one of it's classic episodes. Which one is your favorite cartoon show? This is my 21st post for KBL Jun 2015: My Favorites. 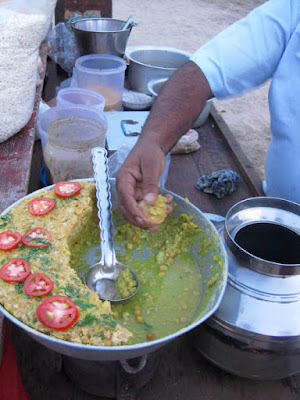 Link to the previous post: My Favorite Indian Street Food. I don't have too many full-family photographs, because usually, Dad happened to be behind the camera. Now we have selfie phones, but, unfortunately, my mom is not alive anymore to be a part of this selfie-crazed era. This one was taken many years ago at the Kanpur zoo. I have no idea why we are all dressed in blue, but I kind of like it. As you all know, blue is my favorite color. Plus, we all look so peaceful and happy in this picture. I am the one in the middle, in case you haven't already figured. And this used to be my favorite sweater until I outgrew it. You can't see it in this picture, the sun is too bright, but there is an intricate pattern of bead-work on one side of the front. Very tiny glass beads. It was really beautiful embroidery. Anyway, do you have any such favorite family pictures? Care to share them on your blogs or on Facebook? Or write about them in the comments below? This is my 19th post for KBL Jun 2015: My Favorites. Link to the previous post: My Favorite Digital Collage Card. At my shop, I sometimes make these collage cards out of photographs that my customers give me. Naturally, I use a software for doing it, which has some ready-made templates. I like very few of those templates though. So I usually end up starting with a blank canvas and do the entire design myself, based on the mood and colors of the photographs given to me, and the occasion the card is meant for. Once, I was given as many as 9 photographs to be set together in a collage. Usually though, it ranges between 2 to 4 photographs, as the final price goes up based on the number of photographs. This one is my favorite of the lot I've done so far. It has space for only one photograph and is one of those I did from scratch. I like it for its sheer simplicity. A female customer ordered it last year. She wanted to give it as an anniversary present to her husband, along with a nice pen. 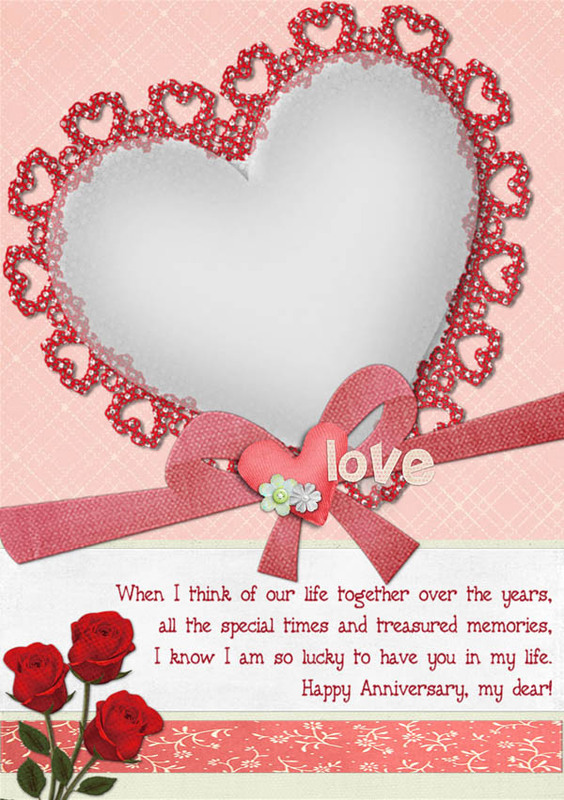 The heart-shaped frame in the picture above had a cute photograph of the two together. I have posted only the design here though, minus the photograph, because I don't think it would be appropriate posting their photograph here without their permission. Anyway, what do you think about it? Do you like it? Do you still give cards to your loved ones on various occasions? Do you buy ready-made cards from the market or do you like to give something with a more personal touch? This is my 18th post for KBL Jun 2015: My Favorites. Link to the previous post: My Favorite Bollywood Song. How can it be possible to choose just one favorite song from our Hindi movies? Right? Still, there is this one Hindi song that just pulls me into it no matter what I might be doing that time or what my mood might be that time. Here's a picture from that song for you to guess it. That's right! It's Pehla Nasha from the movie Jo Jeeta Wohi Sikandar. Singers: Udit Narayan Jha and Sadhana Sargam. Lyricist: Majrooh Sultanpuri. 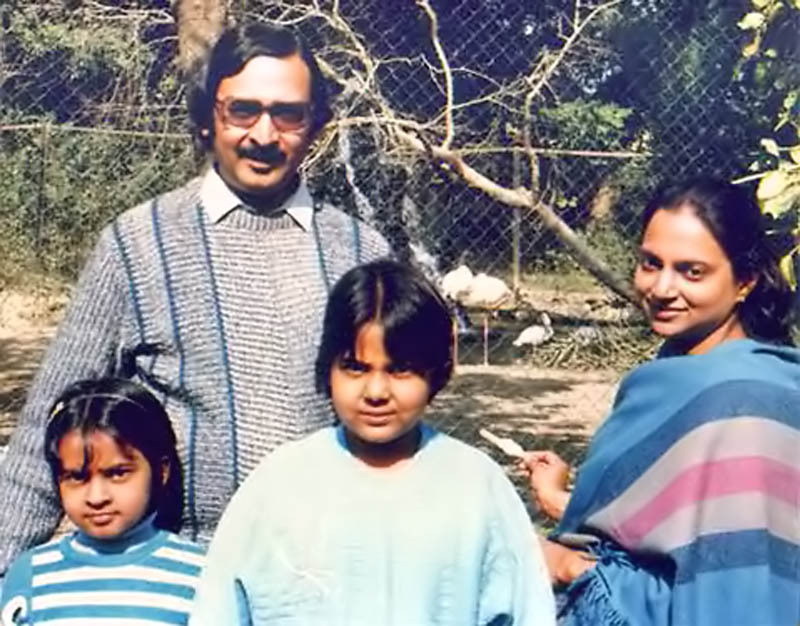 Filmed on: Aamir Khan and Ayesha Jhulka. Did you know that this was the first Bollywood song that was filmed completely in slow motion? I heard in an interview once that they had to lip-sing very fast for this song, so that when the video was played in slow motion (the way it had been planned), their lips would match the audio. Anyway, I just love those opening notes. The moment I hear that tune, I get transported to a different world. Melodious and hypnotizing... no matter how many times I hear it, or however old I get! This is perhaps my most "feel-good" song of all times. Do you like this song? Do you have any favorite numbers from Bollywood? Which ones? Here's more in Music and Videos! This is my 17th post for KBL Jun 2015: My Favorites. Link to the previous post: My Favorite Video Game As A Kid. I used to be crazy about video games as a kid. 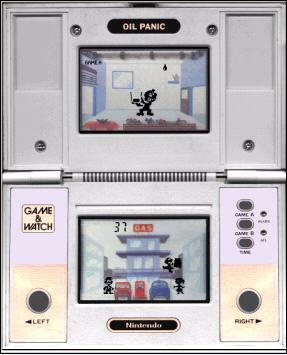 I had the Samurai TV Video game that had many different games. Naturally, there was the traditional Mario Brothers and Bricks, plus there were games like Legendary, Islander, Road Fighter, King Kong, Chess, and even Mahjong, which I didn't know how to play back then! I also had several pocket video games. Among these, my most favorite was Oil Panic. This is what it looked like. So the top screen shows the inside of the second floor of the 2-storey building. The guy on the second floor can collect maximum 3 drops in his small container, which he then has to empty in the big drum carried by the guy on the first floor, making sure that he doesn't spill it instead on the people standing at the ground floor level. I was addicted to this game like crazy. It was my favorite companion back then on train journeys. I had really mastered the art of watching both the screens simultaneously. Man! What concentration I had while playing this game! I feel amazed just by thinking about it now! One of my cousins in Patna (an year elder to me) has actually managed to free the princess in Mario Brothers. He and I were competing for high scores on this game during one of my holidays at Patna. That's the historical occasion when I actually completed it! Oh boy! What days! What simple pleasures in life! Did you play video games when you were a kid? Which one was your favorite? Have you ever managed to reach the end of a game? This is my 16th post for KBL Jun 2015: My Favorites. Link to the previous post: My Favorite Summer Breakfast. Cold coffee with plain unflavored cornflakes and a light sandwich made of cucumber or onion-and-tomotoes or boiled potatoes or left-over vegetable from the night or slices of cold mango or whatever is available at home really. Oh and I add some almonds and raisins also to my cornflakes. 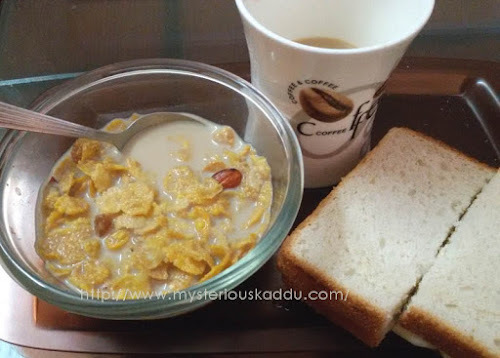 Have you ever tried cornflakes with cold coffee instead of plain hot milk? It tastes absolutely delicious! One of these days, I'm going to get a flavored Amul Cool milk (Kesar or Strawberry perhaps) and try that with cornflakes. I think it should also taste good. What about you? 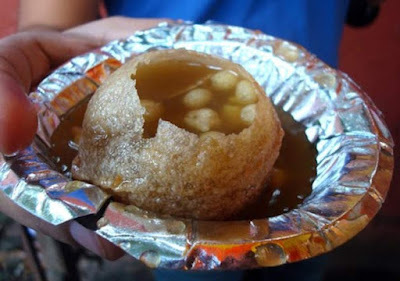 Do you have different favorite breakfasts for summers and winters? What's your favorite summer breakfast? This is my 15th post for KBL Jun 2015: My Favorites. Link to the previous post: My Favorite Game on Facebook. Once upon a time, I used to play a lot of games on Facebook. I have had spells of addiction to the Biggest Brain Game, PuzzleBee Jigsaw Puzzles, Bubble Spinner, and the longest of them all... FarmVille! 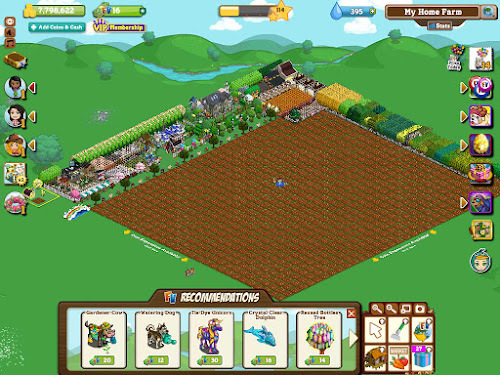 Undoubtedly, FarmVille has been my most favorite game on Facebook... until Zynga totally spoiled it by making it so complicated that it cannot even qualify as a fun activity now. From a simple, uncluttered farm, the game has gone to become a complicated mess of treasure hunts, potion making, cooking, travels to magical islands (or God knows what! I haven't been able to figure out this part yet!)... and a zillion other things! See all those icons cluttering both the sides and the top? Oh and it takes ages to load! I download a 700MB movie in less than one hour on my 3G net. This game takes almost 10 minutes just to load completely! It totally hogs not only your internet bandwidth, but also your entire system. All my other open programs crashed during the time this game was open today! And everything on the farm has become so tiny now you can barely see what you are clicking on! But really, once upon a time, this used to be the funnest game around. I met some really nice people on Facebook through it... foreigners also. Some of them have continued to remain friends even after we've stopped playing the game. There was a lot of community building involved around this game... not to mention beautiful aesthetics and its creative appeal. When I logged in today, it gave me 3 Unwithers free and promised to give 10 more if I return tomorrow. That made me so nostalgic. Once upon a time, these Unwithers were available only for REAL cash! Sighhhhh! How times change, don't they! The game also offered a farm expansion to me today. (You can see it in the second pic.... marked by yellow arrows along two edges of the farm.) I wasn't interested though. I just harvested all my animals, barns, coops, orchards, other trees and whatever else had a pink bubble on it (that meant it was ready to harvest) and got my screenshot for the post. Have you ever played games on Facebook? Which one has been your favorite? This is my 14th post for KBL Jun 2015: My Favorites. 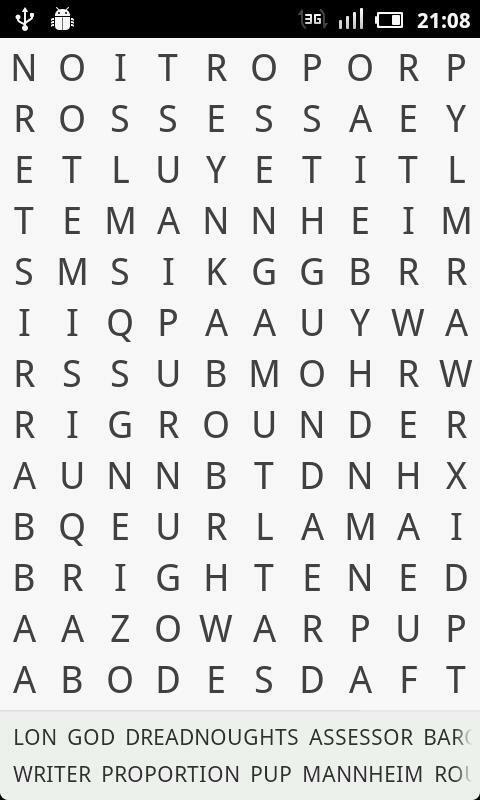 Link to the previous post: My Favorite Word Search Game for Android. I like playing Word games on my android. They generally use minimal resources of your device and have very simple and very basic interface for playing. I have tried many different word games, including Wordathon for Android that Shilpa got me addicted to for a while. 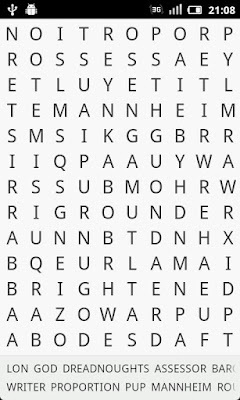 Eventually, though, I just keep coming back to Word Search. You can play it for an infinite period of time. It just keeps bringing a new game. No daily limit or hourly limit or any limit at all. 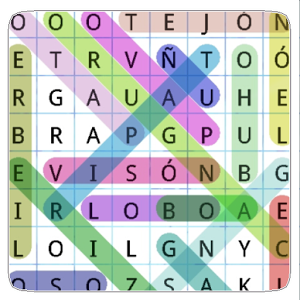 Word Search by Melimots has the most colorful and cleanest interface of all Word Search android apps that I tried. You can also disable the colors under settings and opt for grayscale. The game size changes according to the size of your device. So if you play the game on a phone with a bigger screen size, you get a bigger grid of words. You also have the option to change the letter size if you want a bigger or smaller grid on the same device. The words in the grid run horizontally (both from right to left, as well as left to right), vertically (top to bottom, as well as bottom to top) and diagonally (in all four directions). So it becomes more fun playing the game. You just have to swipe your finger across the word you've found in the grid to mark it. It is very responsive to touch. 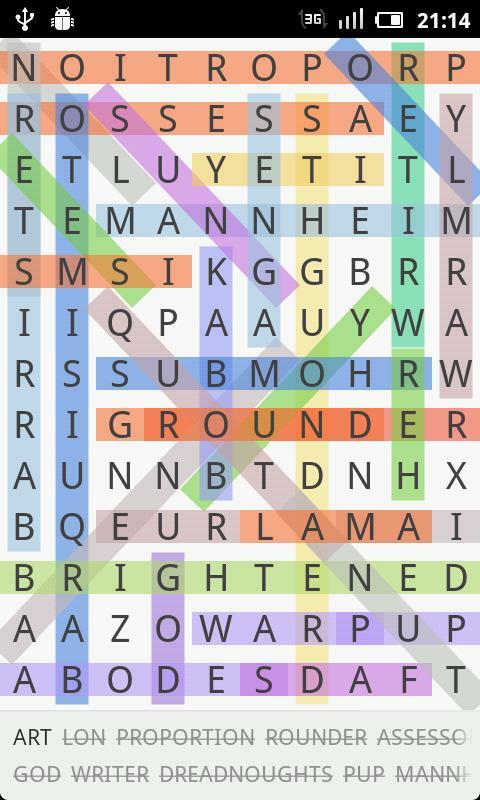 It shows the list of the hidden words, right below the grid. So you don't have to refer to any other screen for the word list. It automatically strikes out the words that you mark on the grid, from the list below. Not only that, it also pushes these striked-out words to the end of the list so that remaining words are always at the beginning, visible at-a-glance. It keeps a record of the best times on the device that can be cleared, if so desired, under settings. 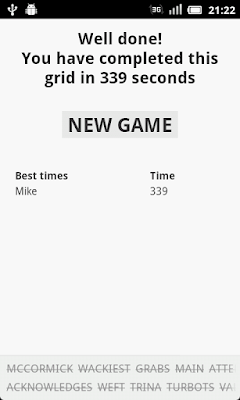 If you get a phone call in between the game, the game timer automatically stops until you finish your all. Like I said, Word Search by Melimots is the best Word Search game that I have found for android. And it is also my favorite word game to play on the phone if I have extra time to kill. 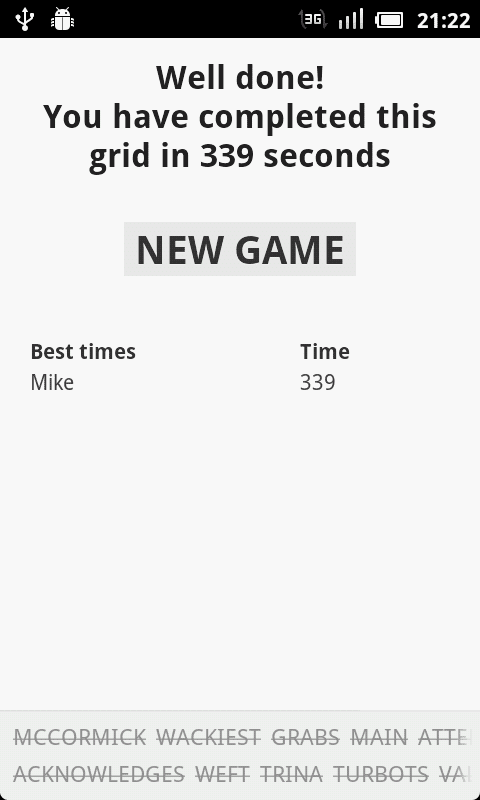 Do you like playing word games on your phone? If yes, the which one is your favorite? What other games do you play on your android? This is my 13th post for KBL Jun 2015: My Favorites. Link to the previous post: My Favorite Hot Drink. If you've been around this space for a while, you know this already... I'm out-and-out a tea person! Here are a few ways in which tea plays an important role in my life. It gives me that much needed mental "kick" when my mind feels sleepy and sluggish. If it's well-made, then it's a perfect mood up-lifter for me. It makes me feel like my purpose in life has been achieved. Full contentment. An occasional, odd-timed, after-lunch cup of tea is a special "bonding ritual" for my sister and me. 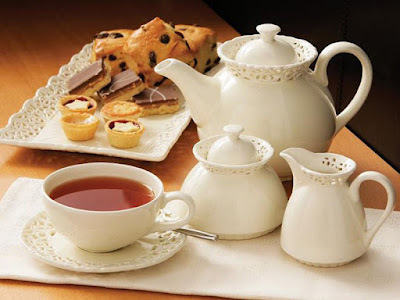 Similarly, an occasional, odd-timed, midnight cup of tea, along with snacks from the office cafeteria, were a special "bonding ritual" between my old flatmate and me in Noida (when we used to work night shifts). Tea is also Dad's way of making up with me after a fight. We don't have the milky Indian tea though. We prefer liquor tea. It was quite a coincidence really. My Dad is the only member of his family who took liquor tea. And he got married to my mom, who came from a family where they had liquor tea too! Having tea together has been a part of our daily morning ritual forever. Here's a picture of it - Tea & Toast! : Photo A Day - Morning Ritual. We even have halwa with tea and paapad! Here, check this out - Photo A Day: Delicious. By the way, we also had those quaint English tea sets earlier, like the kind in the picture above, complete with the spout and even the tea-cozies! They're not "transportation friendly" though (the spout and handles break very easily), so we gave them away when we were relocating. Tea is like a sacred ritual for me, in fact... more meaningful than going to a place of worship. What's you favorite hot drink anyway? This is my 12th post for KBL Jun 2015: My Favorites. Link to the previous post: My Favorite Post I Read Today. I just read this post on a friend's blog, and I liked it so much that I felt I just had to share it with my readers too! This little flower chose to do things differently... or, as Parul says, "found a way for itself"... a way that no other flower had dreamt of! Sure, it's all alone there, but, that's why it got noticed, isn't it so? That's why it got featured in stories on people's blogs. 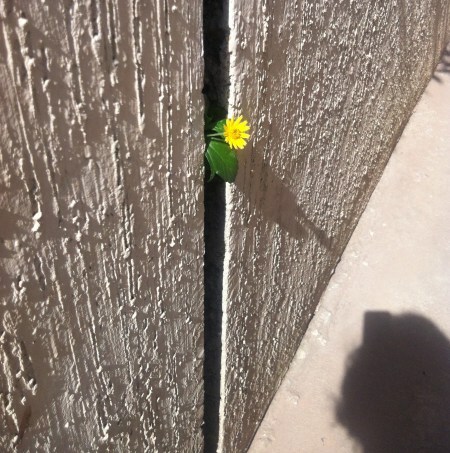 Sometimes, we also need to be like this little flower. We need to have the courage to do things differently, even if that means not towing the line set by our "loved ones". Because when we choose to leave the beaten track and dare to do something different, we become an inspiration for others. That's when we become leaders in the truest sense of the word. This was undoubtedly my favorite blog post today (from whatever little bit of blog reading I managed to catch up with). What's the favorite post you've read today? Do share in the comments below. This is my 11th post for KBL Jun 2015: My Favorites. Link to the previous post: My Favorite Handmade Work. Note: I couldn't post yesterday due to health issues, so back-dating this post by a day. I've been surrounded with handmade art-work since I was a kid. My mom was a real artist. She made a lot of pretty things using different techniques. My favorite are these hand-embroidered cushion covers. The one on the right was completely made by her. The one on the left had been started by her, but then left incomplete. I finished it sometime during my school days. If you look carefully, you'll see it is not as good as hers. My stitches are tighter than hers. They shouldn't be that way. Well, I am a hard critic, even of my own work. What about you? Do you like handmade art-work? Do you create art-work? I've seen some of my blog buddies make really awesome Zentangles. I haven't tried that so far, but it sure does look pretty. I'm personally more into embroidery or up-cycling stuff. Do you have any favorite technique of art-work? 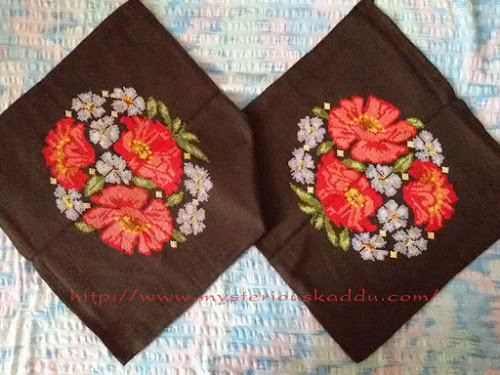 Do you have favorite handmade art-work? This is my tenth post for KBL Jun 2015: My Favorites. Link to the previous post: My Favorite Subject in School. This one's quite easy. In fact, I'm sure many of you must have already guessed it by now. My favorite subject in school was Computer Science. Well... I got introduced to computers when I was in class 5 (that was in 1988). I was actually forced to take it as a subject, based on my marks in Mathematics. I had opted for something else. Eventually though, it became my favorite subject in school. I think the main reason for this was my Compter Science teacher in school - Ms. N. Kapoor. Would you believe it if I told you that I almost flunked Physics throughout 11th and 12th and only managed to get a decent score in the final board exams because of last minute private home tutoring for 32 days? And Mathematics was alright till they started us on Coordinate Geometry and Differential Calculus. After that, it was all pure Greek. In fact, I might have had a better chance at learning Greek probably. Oh and Chemistry was another story! I totally gave up on that subject the day we started on Organic Chemistry! No seriously... you tell me! What would a girl, destined to churn out such literary nonsense on her blog on a daily basis, have to do with organic compound formulas that were so long they didn't even fit on one single line of the notebook? What was your favorite subject then? (Or 'is', if you're still studying.) Have you ever done anything so weird for your favorite subject? This is my ninth post for KBL Jun 2015: My Favorites. Link to the previous post: My Favorite Ice Cream.